Speech delivered by Dr Mego Terzian, President of Médecins Sans Frontières France at the UN donor conference on Syria held in Geneva, Switzerland. Six months after the first international donor conference for Syria, humanitarian aid is failing. Security and living conditions have deteriorated dramatically. The population living in areas controlled by opposition groups have almost no access to official international aid. Across the country, there are enclaves surrounded by intense fighting, where virtually no aid is reaching the people trapped inside. We can attest to the immense needs in the north of Syria, where Médecins Sans Frontières operates five health facilities in opposition-held areas. Already this year, in addition to carrying out thousands of surgical procedures, we have vaccinated nearly 70,000 children against measles and delivered almost a thousand babies, as women have lost access to maternal care. We are providing treatment for cutaneous leishmaniasis and typhoid, as well as other communicable diseases and chronic illnesses such as hypertension and diabetes. Yet given the scale of need, what Médecins Sans Frontières is doing is extremely limited. Most aid in the country is coming through Syrian solidarity networks, but they are struggling in the face of massive medical needs. Their medical assistance is focusing primarily on providing treatment to the war wounded. But what of the pregnant women? And the sick? The Syrian medical networks need more support. The medical imperative is to meet critical health needs, wherever they may be. We are doctors and nurses striving to fulfil that imperative impartially. But, under the current circumstances, we cannot work to our maximum capacity. Medical assistance is being targeted; people in Syria today are risking their lives in seeking and providing healthcare. We negotiate access with all parties, but we have yet to receive official authorisation to work in Syria. Restrictions on the delivery of aid within the country are increasing. Humanitarian personnel who cross front lines risk being shot or kidnapped. So if the aid arriving through neighbouring countries is stopped, a lifeline into Syria will be severed. 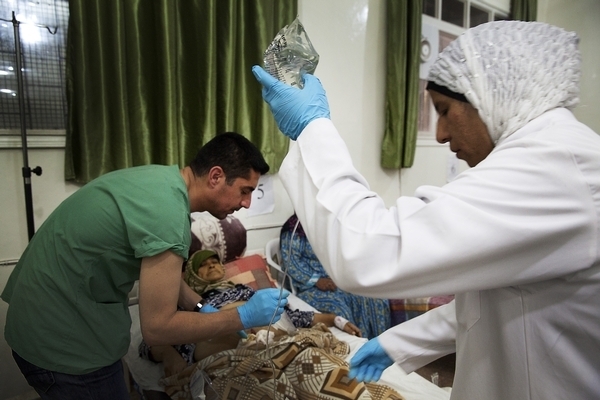 Millions of Syrians will be left without medical services. Neighbouring countries must continue to allow the flow of essential medicines, medical supplies, and medical personnel into Syria. In countries bordering Syria, Médecins Sans Frontières teams are witnessing overcrowded hospitals and poor access to healthcare for refugees and a growing number of local residents. Official aid is dwindling in Lebanon, for example, yet tens of thousands of refugees have still not been registered by the United Nations. Without registration papers, these people are not eligible for most aid, including health services.